Time spent with family is never a wasted moment! 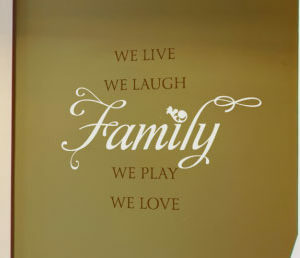 At WiseDecor we have wall words that not only look great on your walls, but also help celebrate family ties. 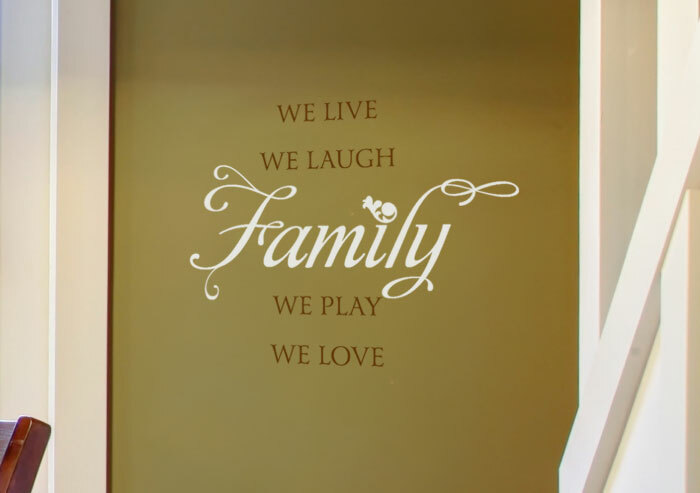 Read on!‘We live We Laugh Family We Play We Love’ wall letters are just right for this dining space in so many ways. 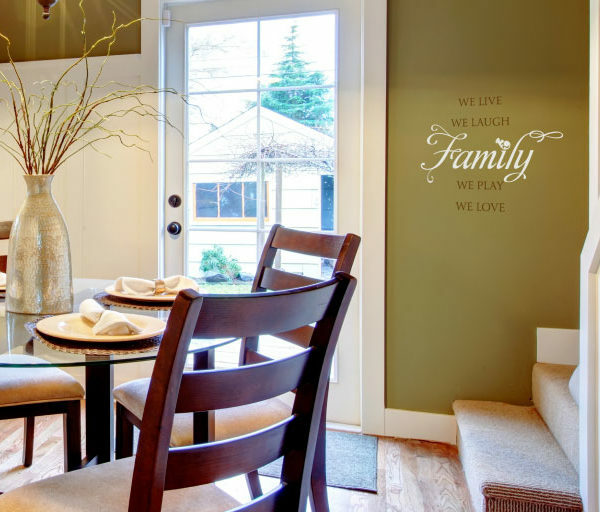 The colors tie in to the white, green and brown color scheme in the kitchen and dining room! They are the perfect match not only to the eye catching flower arrangement on top of the glass toped dining table but to the kitchen cabinets, staircase, hardwood floor and vase as well. The wall lettering style is bold and playful at the same time creating a trusting environment. This is a space that your family and friends will enjoy using! 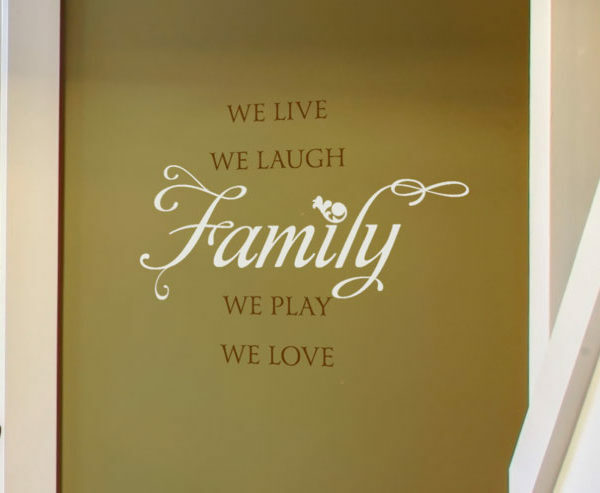 Our wall words are ideal for creating focal points. This is achievable because they are available in different colors, styles and sizes which tie in with the furniture and accent pieces in your home! Once the wall quotes were applied on the wall space opposite the staircase, a new focal point was created. They look painted on but without the hard work that goes with painting! They can also be easily removed and applied onto another spot. Application is that simple: it’s not rocket science! Our wall quotes are affordable. We even have a reward program that enables our clients to purchase more for less. Do sign up! 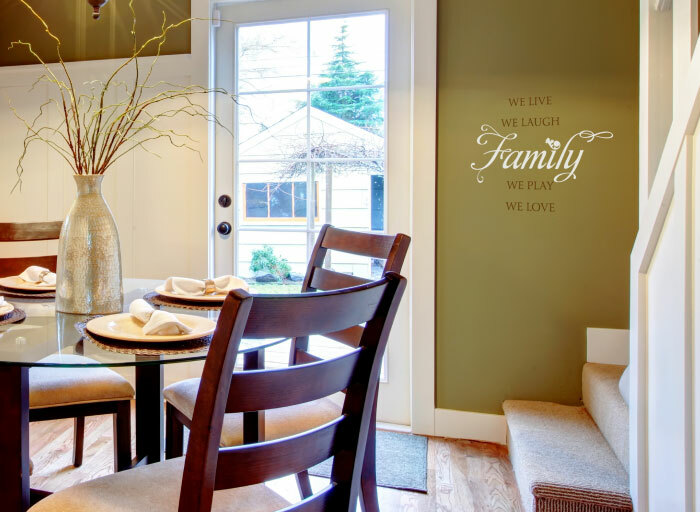 Get in touch for wall decor that’s dining friendly.